The King is back! Since his last movie in 2005 directed by Peter Jackson. 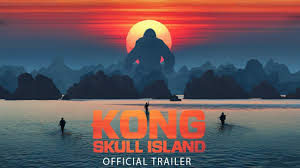 Kong: Skull Island ,directed by Jordan Vogt-Roberts, is those kinds of Hollywood sequels we don’t expect but we don’t mind. Where at the start throws you back in a series of montages of bombs and crashes of WWII and the Cold war. 1973 The government-funded an expedition ,during the last days of The Vietnam War, to explore the recently discovered island, deep in the South Pacific. Soon, a detachment of nerds, soldiers, a tracker and an ambitious photojournalist (like those photojournalist that is life and death to record stuff) will be there to either gather undiscovered plants or new discover species and well let’s just say that well they found something big. Okay let’s get real here who are we kidding you’re probably not here for the story or the characters but the damn huge ape himself, and doesn’t he look magnificent. With motion capture by ‘Dawn of the Planet of the Apes’ his tactile fur and eyes, Kong comes to life .